Most slip and falls are caused by unexpected changes in walking surfaces according to Barrett Miller "Investigating Slips and Falls: The Complex Dynamics Behind Simple Accidents". "If we see a potential hazard, we can adjust our behavior. It's the unseen hazard that places us at maximum risk." Slips occur when there is not enough friction or traction on the surface on which you are walking. Trips most commonly happen when your feet come into contact with unexpected objects and you lose your balance. 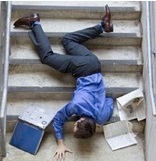 Falls usually take place from one level to the next, such as on stairs or a ladder. Items lying on the floor where people walk such as cords, tools etc. Attorney Randall Spivey, Spivey Law Firm, Personal Injury Attorneys, P.A. has seen first-hand how serious, long-term injuries, health problems, even death can result from slips, trips and falls. "These injuries could be head injuries and/or broken bones, pulled or torn muscles, sprained joints and internal injuries." says Attorney Spivey. According BrainInjuryInstitute.org, slip and fall accidents are the leading cause of brain injury. Statistics report that approximately 35% of brain injuries are caused by falls. Thousands die from falls including the senior population, where it's the leading cause of death. If a slip, trip or fall happens in a public place, it may be the result of the negligent actions of others. Business owners have the responsibility of providing safe public areas. Failure to do so, may result in a personal injury claim.